By the beginning of November the look of the cities, department stores, malls and the neighborhoods changes from Fall like colors to the more festive scene of the "Vor - Weihnachtszeit" - pre Christmas season. At the latest the week before the first of Advent, almost every household has their Christmas decorations up. But not their Christmas tree! We will get to that later in this story. The decorations are less bright and colorful as ours in the US. 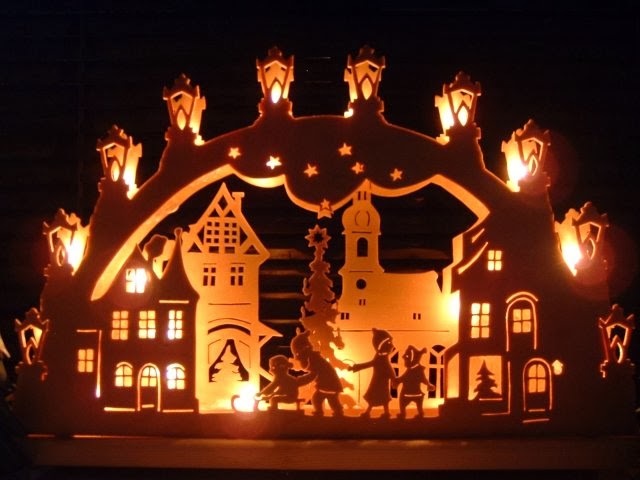 You will find beautiful Schwibbögen (hand carved wooden arches with lights and a Christmas scene) in the windows, the traditional pyramid propelled by real candle power and much more. By mid - November famous Christmasmarkets open their doors. This is a long standing tradition and a must during pre Christmas season. Almost every town or city has its own Christmas market. Wooden stalls decorated with evergreens display handcrafted art such as Christmas ornaments, accessories, mangers, household items needed for the baking of Christmas goodies. And food! Tons of food. You can find anything from traditional Brats placed in a bun (you will not find anyone putting Sauerkraut on that bun, this is a separate dish only served on a plate), Schupfnudeln, which are basically oversized Spätzle mixed with Sauerkraut (here it is), bacon and onions, usually prepared in a huge pan, Crepe, Germknödel (an Austrian version of a sweet plum jelly filled dumpling served with vanilla sauce and ground poppy seeds mixed with powdered sugar on top) to just name a few. Lets not forget the drinks. As you might know, Germans do drink alcohol in public places. You will find the German version of mulled wine, called Glühwein served at every corner. Usually sold in a ceramic mug which you need to pay deposit for. Yes, and this is one thing you need to know while visiting Germany. You will hardly find plastic plates, cutlery or cups. You always pay a deposit which can be quite an amount that makes it worth bringing it back. It will then be cleaned and handed out to the next customer. Germany is very "green", this is one way to find out about it. Keeping the mug as a souvenir is very common. But back to our Glühwein. It comes in all different flavors. I like the traditional one the best. But there are versions with Rum, Amaretto, hot cherry, blackberry or strawberry wine. Another favorite is Jagatee from the Alpine region. It is a mix of black tea, herbs, red wine and Schnaps (the German/Austrian version, a kind of a brandy, not to compare with what we call Schnaps here). And Met. Have you heard about Met yet? This is a hot honey wine, very sweet, but delicious. I have been told it prevents colds or if you already suffer from a sore throat, it will treat without taking any meds. There is non alcoholic punch, hot chocolate, tea and much more for the kids or people who prefer non alcoholic drinks. Now close your eyes and imagine being right there. 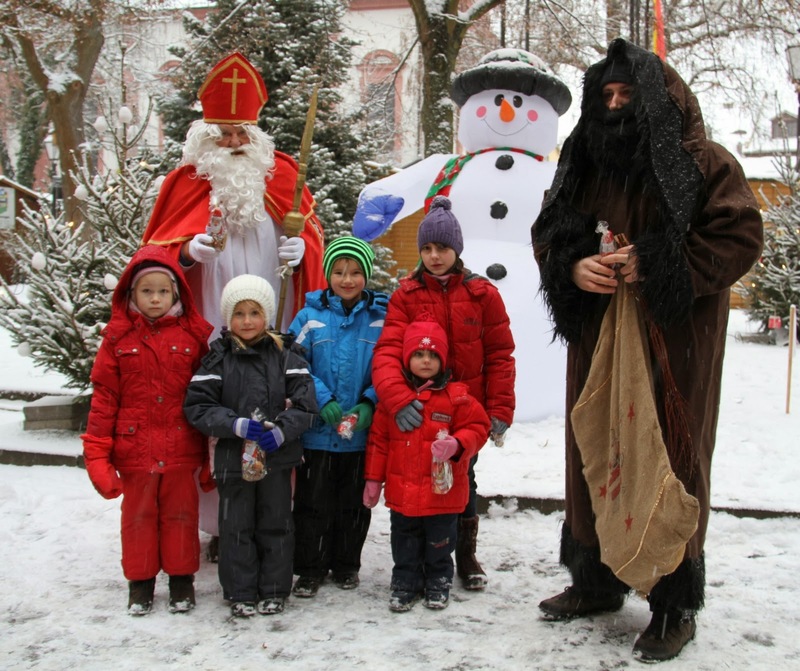 Can you smell the mix of the Glühwein, roasted almonds and chestnuts, Brats and Crêpes? Do you hear the Christmas music playing? Or even the kids choir performing right at the center of the market square? Can you see your kids getting eyes big like saucers when the Christkind or Nikolaus , our Santa Claus, walk by? Yes, this is the Christmas market feeling. Happiness with 100% total immersion. And soon, you will feel like a kid again! You might ask yourself what this " Christkind" is? There are two different traditions in Germany. The Weihnachtsmann (Santa) and the Christkind. 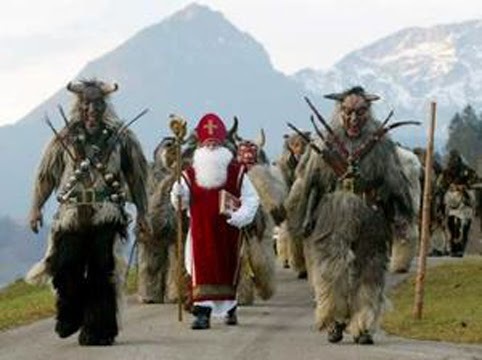 The Northern part of Germany has the Weihnachtsmann, which is basically Santa Claus who brings the presents. 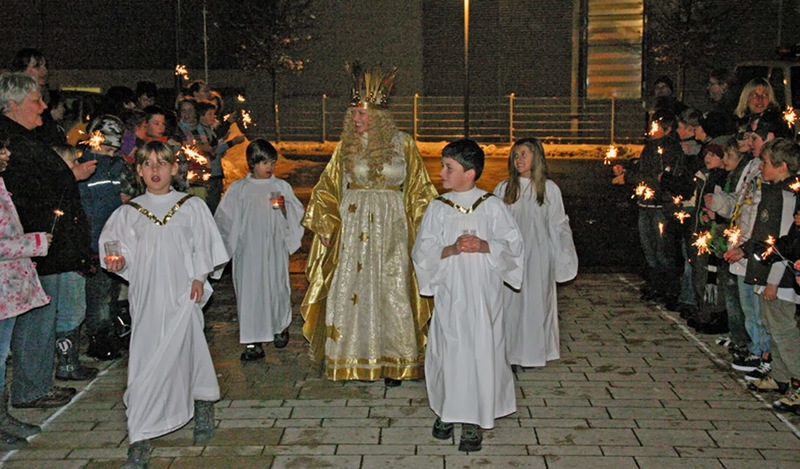 The Southern part of Germany and also Austria believe in the coming of the "Christkind" - the christ child -, which is baby Jesus. Christkind looks like a golden angel and is female. But kids do not ask, they are simply in awe when the "Christkind" appears. 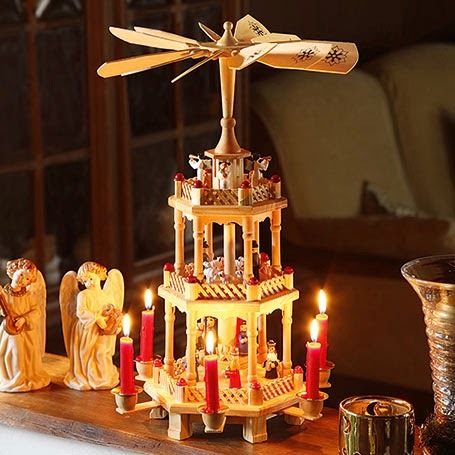 At home, the Adventskranz is a must have. At the first of Advent the first candle will be lit to start the countdown to Christmas with all 4 candles shining brightly. Another way to countdown is the Adventscalendar. Very popular with the kids, but you will see some adults still having them ;-). First day to open is December 1st. And you count to 24 until Christmas Eve. December 6th is another milestone in the Vorweihnachtszeit. The night before December 5, the kids clean their boots ! ( I always took out the biggest ones I could find like my Canadian boots) and place them outside near the front door. Some even place their Christmas wish list in there for Santa to bring to the Christkind. Every kid gets a goodie bag out of St. Nicholas' sack after he is done reading the story about that special kid. Why December 6th? This goes back to the holy Saint Nicholas, who died December 6th, 343 AD. He was a bishop in what is now Istanbul, Turkey and he was known to secretly shower presents on the poor. 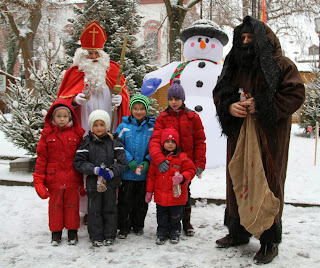 That's why Nikolaus mostly looks like a bishop when you see him in Germany. 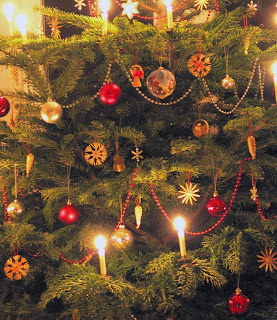 Soon, the big night, the Heilige Nacht - Holy Night, December 24 approaches. During the morning families prepare for the night, running last errands, one last Gluehwein at the Weihnachtsmarkt. And then comes the Christmas tree! Traditionally the day of Christmas Eve you get that tree which you have bought at one of the numerous christmas tree farms into your house . 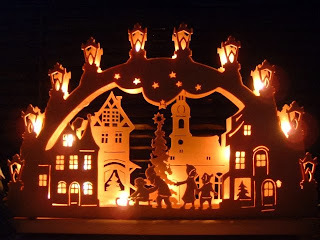 There will be lots of laughter and joy while decorating it all together, drinking hot chocolate and eating Weihnachtsplaetzchen (Christmas cookies). You might also hear Dad mumbling under his breath when that tree stump simply doesn't want to fit in the tree stand ;-) And then you dress up and get ready for church. If you can, you walk there. There is something miraculous and mystical in the air that very special night, don't you agree? After church, you go home and have dinner. The Weihnachtsstube (christmas room) has closed doors so the Christkind won't be disturbed when bringing the presents. 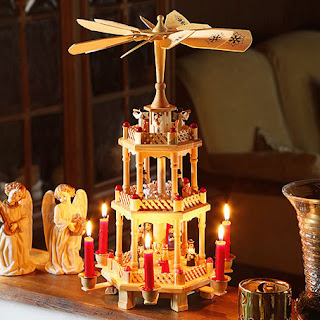 The kids cannot wait and listen for the sound of that bell coming out of the Weihnachtsstube which finally signals to them that the "Christkind" has been there, brought the presents and left the room. If you go in before that bell sounds, there will be no presents for you! But if you did behave and waited until that bell rang, oh my, opening that door and seeing the Christmas tree in its beauty with the shining candles and all the presents, priceless. There are no presents the next morning! And no Santa coming through the chimney. You will hardly find an open fireplace anywhere in Germany. But lots and lots of food. There are 2 holidays following Christmas Eve. All for visiting family and eating, eating, eating. Traditional food for Christmas Eve can be everything from Wienerle with potato salad to filled puff pastry shells with ragout. Usually we keep it simple Christmas Eve and focus on the celebration itself. 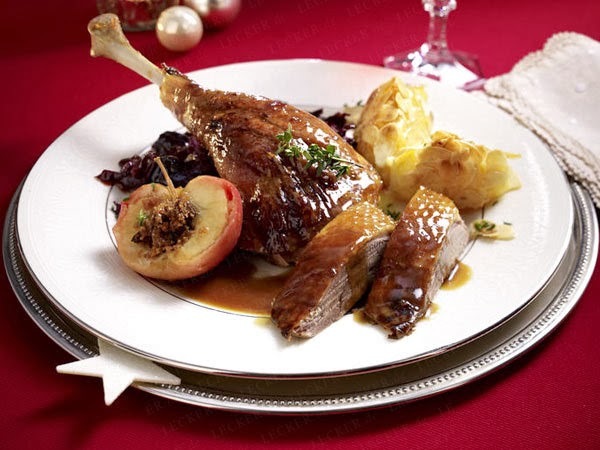 The next two days you will see the Weihnachtsgans (Christmas goose) served with red cabbage and dumplings, the beef roast and so many more hearty dishes. And the Schnaps, like Obstler, Willi or Marille, will help to digest that heavy food. 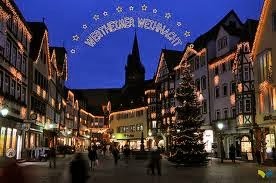 Now, would you like to experience a traditional German pre Christmas season or even Christmas? There are so many ways to do so. 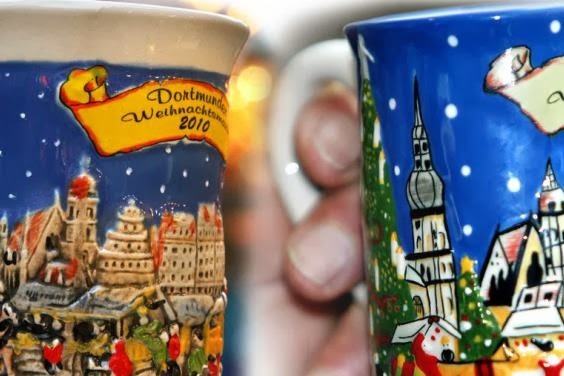 If you like Christmas markets consider taking a Christmas market river cruise which will take you to another city every day, experiencing them in different countries. Or combine a city tour such as Nuremberg which is world known for its Christmas market followed by a skiing trip to the wonders of the Alps. There are numerous ways of experiencing the old world charm during the Christmas season. Contact Ellen by emailing her at tripdesign4u@gmail.com to start your miracle Christmas vacation.